Calidore | A Life Of Intertwining Threads. It’s time for a change. It’s time for me to stop looking and dreaming about all the things I want to do and to actually start DOING them. I want to grow more vegies, get my garden organised, plant fruit trees, have more chooks and change my life in a positive way. I realised this morning (bit of an epiphany while mowing lawns and pulling weeds) that it’s up to me to make the changes I want in my life. While Ashley and the kids are there and help me when I need it, I am the one who needs to change. Not only my mind set but also the physical side of my life as well. I can dream all I want and plan lots and lots of projects but unless I physically get out there and start doing them then all they are are dreams. Dreams that with a puff of wind can float away never to be recaptured. I don’t want that. So what has bought this about? Well for a start off this has been brewing in the back of my mind for months. It certainly isn’t a “flash in the pan” kind of thought. I have been drifting for far too long and it’s time to start living. This year has been one of tremendous changes and lots and lots of stress. James and Elise are enjoying school and university and both doing very well however Nicola has been very ill. We still don’t know what is wrong with her and while the Doctors are doing all sorts of tests that is no actual diagnosis as yet. Her illness is so bad she hasn’t actually been able to even attend school this year. Her illness of course has meant a very big rearrangement of our priorities and what is important to us as individuals and as a family. Both Ashley and I have an overwhelming desire to be more independent of the big corporations (power, water, supermarkets etc) and are working towards being a lot more self sufficient in both power, water and what we can grow to eat. We also want to get our home loan paid off (sooner rather than later) so that if Ashley wants to he would only have to work a few days a week freeing him up to work on the projects he enjoys and that appeals to his creative side. We want to be able to spend more time together and with our family rather than running around like chickens with our heads cut off working long hours to pay the bills and having nothing to show for it. I have found myself more and more researching all sorts of ideas on the Internet. Looking at You tube videos on various methods of gardening and spinning and watching Documentaries. Then it hit me. All that time on the net was time I wasn’t living. While I was learning and getting lots of ideas that knowledge was useless unless I started to use it in a very practical way. And quite frankly I’m sick of the Internet. I’m fed up with the time it takes from my day – restricting myself wasn’t helping – and it was stopping me from doing what I wanted to do. Yes it has it’s uses but it needs to be in very limited amounts. For some time I have been seriously thinking about stopping blogging. I have been posting to this blog for seven years. Not as long as some but a long time for me. I felt a tremendous amount of guilt every time I thought “enough blogging or I don’t want to do this” but no more. It’s time to stop. I honestly don’t have any more blog posts in me and I don’t want to post. I’m not going to delete my blog – well not yet anyway – but the day will come. I know some series of posts are unfinished but I just don’t have it in me to continue with them. Blogging has become a chore and has been that way for some time and when something is a chore it’s not enjoyable and I need to enjoy my life. I want to say thank you to all those who have read my blog over the years. To those who have become good friends via this blog. Thank you. 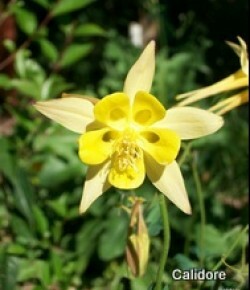 We will keep in touch and I will continue to read your blogs but in a much more limited way. I’m off to live my life. I’m going to do a few tutorials on spinning and the associated tasks that are involved in creating your own yarn and split the whole process up into sections. I’m working on the theory that it will make the information more manageable to read and process and also to find if you want to review a particular technique you won’t have to scroll though a massive post. All of the posts will start with “Spinning” and then a description of the technique. eg “Spinning – Preparing the fleece” I want to emphasise that I’m not an expert by any means – in fact I’m totally self taught and watched lots of You tube and read books to get this far. This is just how I go about the whole process and others will do it differently and it’s up to you to work out the best method for you. I’m hoping that if nothing else it will get some of you excited about trying spinning for yourselves and creating that beautiful one of a kind yarn or answer some of the questions you may have had. I’m also endeavouring to use techniques where you don’t need a lot of equipment and therefore a lot of expense. Lets face it – spinning like anything else can be done on a budget or you can spend a fortune. It’s really up to you but personally I like using just what I have at home and quite frankly I would rather spend my money on gorgeous fleece than equipment. Any fleece whether it be alpaca, wool, rabbit or anything else remotely spinnable will need some sort or preparation in order to be able to spin it into the kind of yarn you want. The amount of preparation is up to you. Some spinners will just get a hand full of fleece, tease it out with their fingers and start spinning. I have tried that but it doesn’t work for me…sigh…so a little more preparation is needed. I should add in here this is my way for preparing a fleece to “Spin it in the grease”. In other words you are preparing a fleece that will still have all it’s sheepy smell and lanolin in it. You can wash the fleece first and I may cover that later but I figure apart from the smell, the lanolin does wonders for my fingernails and I have to wash the fleece once I have spun it so I’m just missing out a step. Unlike humans, sheep, (and I will use their fleece as the examples in these tutorials – but the techniques will work with just about any fibre) strangely enough don’t have access to showers and shampoo and they have a distressing habit of rolling in dirt and lying in prickles which means for the Spinner that the dirt, prickles and other vegetable matter has to be removed before spinning can take place. The only exception to this, I have found, is some beautiful Corridale sheep’s fleece I purchased, where the sheep had worn coats covering their fleece for the entire growing season which meant there was no prickles or dirt and very little prep time. I’m kicking myself I did not buy the entire fleece and instead, only bought half. When you pull out some of your fleece, and just work though a few handfuls at a time or you will quickly be overwhelmed, this is probably what it will look like. 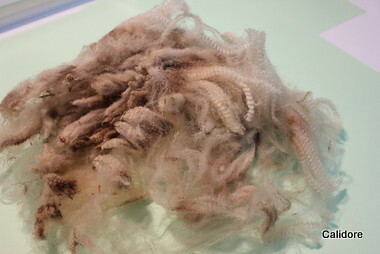 The Darker tips of the fleece are the “outside” furthest from the animals skin. This is the area that rubs in the dirt and the prickles. ) Like human hair this also can be very dry and I have been known to trim off the driest tips with scissors to give myself better wool to work with. It didn’t matter and you certainly couldn’t see where I had trimmed it once it had been spun. The lighter crinkly bit is the fleece that is closest to the skin and will give you more of an idea what colour the finished yarn will be. Well that’s the theory anyway. I have often been pleasantly surprised by the colour the fleece is when it’s finally spun, washed and ready to use. 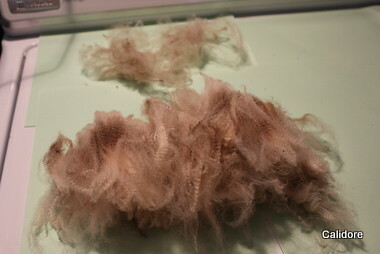 Next is to start to separate the “locks” of fleece. Grasp a small section of fleece firmly and gently ease it away from the rest of the fleece. You will find it will separate fairly easily. Put it to one side and continue until all the fleece you are working on is separated. If you have to, put one hand on the clump of fleece to hold it in place while you are separating the smaller section. How big a section of locks you pull away at a time is up to you. Just don’t get too greedy and grab huge handfuls. That’s generally when you end up in a big mess and get totally frustrated. Far better to work in smaller quantities and have more success. The added bonus is small clumps are easier to comb. You will end up with two piles like this. The bigger one is the fleece you will use. The smaller is the rubbish fleece. It’s made up of smaller cuts (second cuts where the shearer has had to have a second go at getting the fleece off), scrappy pieces and just plain rubbish. Throw this out. It’s no good to use – unless you are really desperate to make life hard on yourself and trust me you won’t get quality yarn out of this rubbish. I quite often put these bits in an onion bag and hang it out for the birds for their nests. They love it. Next is the combing of the fleece and it’s exactly that. 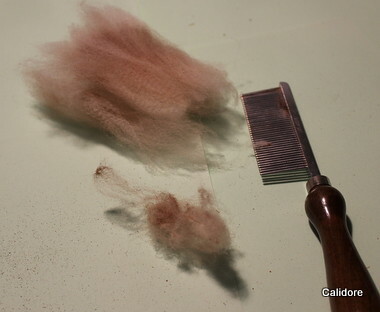 You will comb each section of fleece to remove the dirt and vegetable matter. 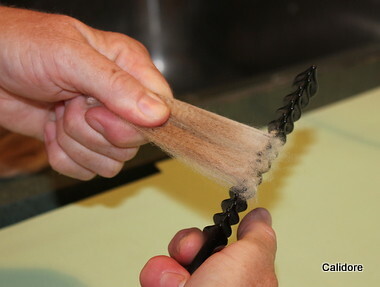 It will also remove any short fibres and broken ends – a bit like combing your own or your kids hair. The above photo shows some of the tools I use. They are labelled so should be self explanatory. Now I said you can use what is just lying around and apart from the two flickers that is what those tools are. 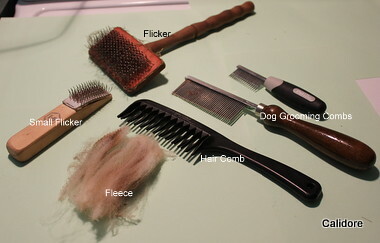 Two dog combs and a human hair comb. Grasp the end of your fleece – the one that was closest to the sheep’s skin and hold it firmly. With your comb of choice – pull it firmly through the fleece. 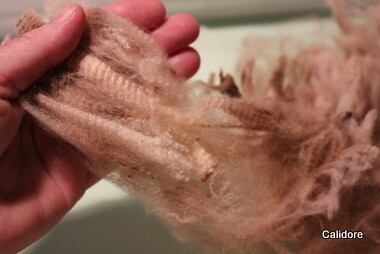 You may need to do this a couple of times on both the top and bottom of that clump of fleece. 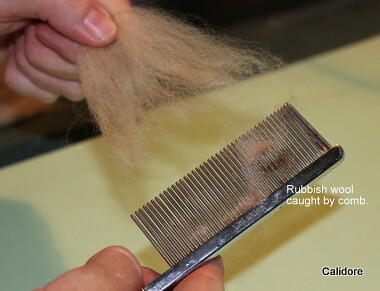 Now swap the fleece around and hold the combed end in your hand and comb out the other (skin side) end. This won’t take as much work and I find it is the most enjoyable. You can see in the dog comb’s teeth the bits of fibre. This is the stuff you don’t want to spin. It’s made up of rubbish. What you want to spin is that lovely clump (wish I could find a better word than that) that is tangle free and ready to go. See photo below. The fleece will fan out a bit when you have combed it. This is a good thing and makes spinning easier. Notice also the dirt (that’s that brown stuff on the paper that looks like pepper). 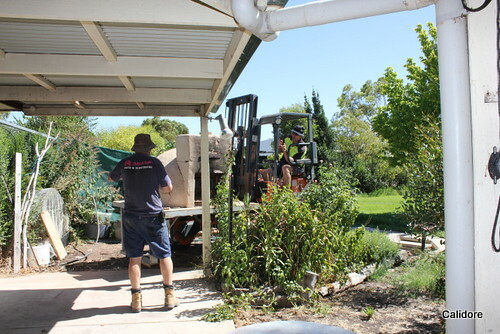 There was heaps come out of this lot of wool – all mallee sand. So that’s it. How to prepare your fleece. Easy wasn’t it….lol. As I said before it’s very easy to look at a huge fleece and start to panic as to how you will ever get it all done. Like eating an elephant – you do it one bite at a time. I generally prepare fleece for 15 mins at a time then walk away. That way my hands don’t get to tired, I’m not stressed but I feel that I’m making progress. Store your prepared fleece in a cardboard box – not plastic. Another way of looking at it is there is no way you can spin an entire fleece in one day – unless you are Superwoman – so you don’t need to prepare the entire fleece in one day. Now if I haven’t explained anything clearly enough – and I hope I have – please ask. I’m more than happy to try and explain things better. The next tutorial will be on the Spinning Wheel. The parts of it. The Strange names each part has and even the different types of wheels you can use. Had a wander through the op shop today just for curiosities sake and found this cook book along with a brand new skirt pattern and all it cost me was $1.50. Bargain! 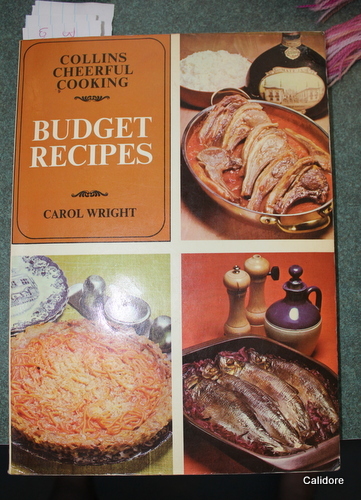 There are loads of budget friendly recipes in there all divided into sections according to the main ingredient. Beef, lamb, pork, chicken, vegetables etc. The bits of paper sticking out of the top of the book are the recipes I’ve picked to try first…lol. I have a freezer full of lamb chops and many of the recipes will be easy to convert to using lamb so it will solve the problem of not wanting to serve up lamb chops every night….lol. Maybe my menu planning might become a little easier if I’m lucky. One of the things that I am going to focus on more this year is stockpiling food, toiletries, some medical supplies and other essentials. I already have a good stockpile of canned goods – spaghetti, baked beans, soups etc plus the essentials like toilet paper, cleaning products – which of course means plenty of bicarb soda, vinegar, soap making supplies and so on. Baking ingredients are pretty much taken care of as well along with pasta, herbs and spices and other condiments. There is always plenty of bottled fruit in the cupboards and hopefully if the vegie garden produces well there will be plenty of vegetables preserved as well. Many will be stored in the freezer or turned into pickles or chutneys but I also want to have some “shelf stable” vegetables which means dehydrating them. Why shelf stable vegetables? Well if the power goes off for a considerable amount of time there is always the problem of the freezers not keeping everything frozen which could, in a worst case scenario mean that the food in the freezers will be lost….after all there is only so much you can use up before it’s not safe to use. Now while I would imagine that scenario might have a 1% chance of happening – as we do have solar power and a generator – sometimes events happen that are beyond our control. Recent floods in Queensland come to mind. It’s also a very satisfying and safe feeling knowing that should money become tight for whatever reason or I can’t get to the supermarket there is plenty of food here to eat. I also think that preserving food should be a skill that everyone has. We shouldn’t have to rely on supermarkets for our food. Basic skills like budgeting, cooking, preserving and even gardening should be taught at schools in my opinion – after all we seem to be raising a generation who often believes that the only way you can get food is from a supermarket and that living on credit or beyond your means is an acceptable way to live. I won’t even go into what I think of supermarkets and how they treat farmers. Throw in the fact that I love to experiment and it’s pretty much a win, win situation. I have already dehydrated onions and they worked brilliantly so today it was the humble carrot’s turn. I bought several bags of carrots when I did the groceries the other day with the intention of dehydrating some if not all of them. At 99 cents a bag (each bag was a kilo) even with the cost of power to run the dehydrator it will still work out cheaper than buying dehydrated carrots. I’m working on the theory that if I run out of carrots, the price rises to a ridiculous level or I have none in the garden at least this way we can still enjoy them. 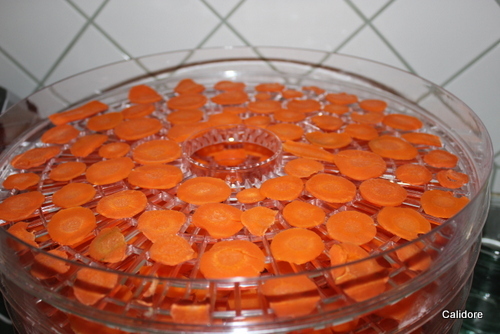 Following the instructions in my Dehydrating book you peel the carrots, cut them into 1/8 inch or 3 mm slices, water blanch for 2 to 3 minutes, chill in iced water and allow to drain, pat them dry then load the dehydrator trays. It says to dry for 12 to 18 hours at 120 degrees F. or 50 degrees C. and to keep rotating the trays until they are crisp and dry then store in air tight container. 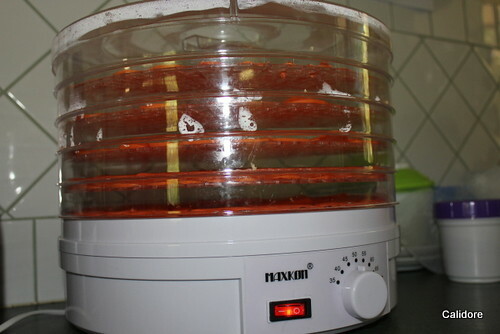 I also found the other day a site dedicated to Prepping which gave instructions for Dehydrating Potato which is next on my list and I want to try dehydrating eggs. I looked at powdered eggs in the supermarket the other day and they were nearly $6 for around 150 grams which, according to this article, is the equivalent to about a dozen eggs. With all the eggs I have sitting in the fridge surely they can’t be too hard to do. Some sites say to dehydrate raw eggs but others say to blend the egg and white together well and cook them in a non stick pan until they are done then dehydrate the cooked eggs. I’m leaning towards this method as I would think if there was any chance of any bacteria the cooking process would deal with it. I will let you know how I get on. Finally my tomatoes are starting to ripen. So much for any thoughts I might of have of having home grown tomatoes for Christmas. 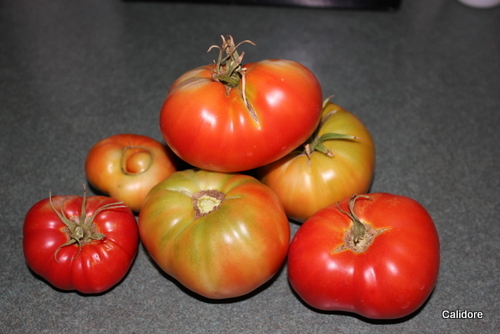 These are Brandywine tomatoes and I’m definitely growing them again next year…..although I will try to get them started sooner with the hopes of a longer season. I grew these from seed and they are a delicious tomato. Meaty, not to many seeds and big enough to fit (just) in my two cupped hands. These are big enough that one slice is half a sandwich and I have also found they aren’t too acidic which is lovely. I’m getting two or three every couple of days – picked when about half flushed with red and allowed to ripen on the kitchen bench, which means I have a constant supply for salads. I am going to create another category for “Dehydrating Food” and each time I try something will put it into this category so if any one is interested and wants to see what I’m doing – or I have had a senior moment and forgotten just how to do something – finding the relevant posts should be easy. We have wanted, or should I say Ashley has wanted, a pizza oven for ages. I bought him a book on building them a few years ago and he got really excited about building one but as often seems to be the case, time and lack of materials and money seemed to always be against us. 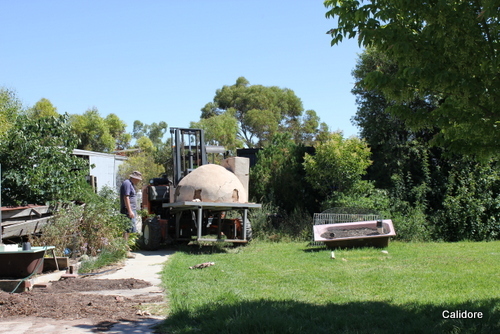 A couple of months ago he was looking at random stuff on ebay, as you or rather he does, and found a pizza oven not far from us and at a good price. So of course he bought it. You know how stuff happens for a reason? That by waiting long enough and the stars aligning and the toast being cooked the right way just makes something happen. 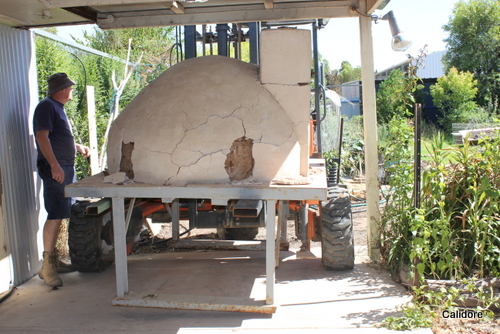 This pizza oven is one of THOSE things. Old Mr M. (to differentiate him from his son) lived behind our mate Mick at Lake Boga. 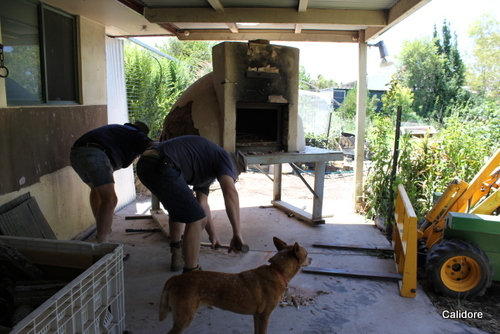 Old Mr M. had a pizza oven which due to age and infirmity didn’t use – Old Mr M’s not the ovens. Mick tried to catch up with Old Mr M. in the hope we might be able to buy it off him but to no avail. That was several years ago. Old Mr M. passed away and his son sold the oven to A. No more was heard and we moved on with our lives. A. put the pizza oven up for sale on ebay and of course when Ashley saw how close it was and how cheap it was he bought it. Turns out that Ashley went to school with A., has remained friends with him and his lovely partner (also named A.) who also happens to be my hairdresser. A. while not super happy to be selling the pizza oven was happy to sell it to us – he and his partner A. had hoped to set it up and use it but circumstances arose that meant they had to sell it – as they figured we would appreciate it for all the right reasons……………….and he was right. I’m telling you this is a proper pizza oven. A hand built Italian made oven by Old Mr M. which A. assures me I will be able to cook anything in it and it will outlast us and possibly our children and grandchildren – which, quite frankly, is a really awesome thought. Just before Christmas A. delivered the oven very carefully so it didn’t fall apart, fall off the fork list or have some other catastrophe. 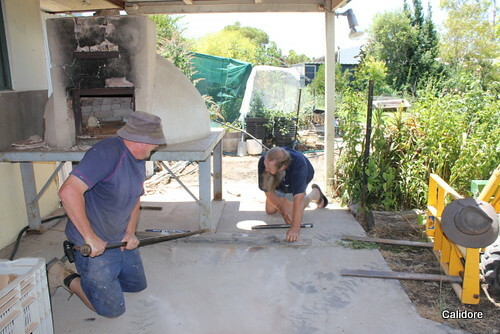 It took until the middle of January to begin clearing the pergola so we could ge the oven in. Once again a friend, and also Elise’s boss, came to our help with his forklift to shift the oven. It caused both men some head scratching and serious thinking on how to lift the oven without it flexing and breaking despite the steel stand it sits on. 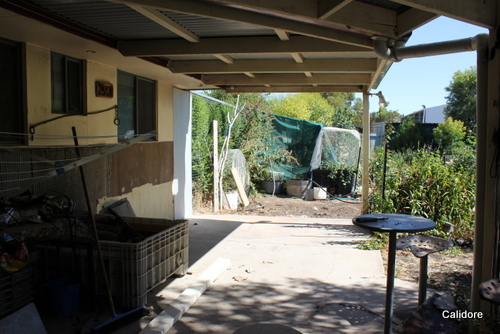 There was some damage – we expected that – but in the end it was sitting in the pergola near it’s final position. The next day our friend Mick (the same Mick who lived behind Old Mr M the man who built the oven) turned up to help Ashley and the lads wrestled the oven into position near the wall. Milly was very good at supervising them and giving them a lick when she thought they had done a good job…..or maybe she was just wiping the sweat from their respective brows. It was a big job but a bit of ingenuity, some round steel pipe and a lot of pushing and shoving and comments like “golly that’s hard to move” or comments like that but not nearly as polite and the boys had it in place. Now the repairs will begin but that’s another post. It’s hard to believe but today is the first anniversary of when Ralf choose Elise and came home to live with her. It’s been a year of learning for both of them. Learning to love each other…..that bit was easy. Learning just who was boss…..Ralf won that one. Learning that if Mum leaves she will come home ….that was the hardest for Ralf to adjust to. Learning that no matter what they can both rely on each other. Learning that if Ralf wants to sit next to you or on top of you – he will no matter what. Learning that Ralf loves to “clean” the bedside table – especially if his Mum isn’t getting out of bed quick enough to suit him. Click on the Picture to check out Ralf’s cleaning skills. Learning that his extended family love him all the more just because Ralf is Ralf. If you want to read the story of how a lost and lonely cat found his real home with Elise you can find it here. Now not that I’m celebrating but like so many other parents I feel a slight tingle of joy at the thought of being home alone today with only the dogs and cat for company. Alas that moment of joy ended when I realised Nicola wasn’t going to school as she was still sick – but more about that in a moment. James was up and dressed and ready in double quick time this morning. He said he wasn’t nervous. 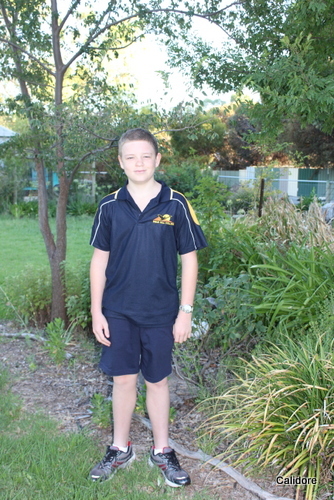 He just wasn’t looking forward to the school work “cause they make you learn stuff” but was looking forward to the different classes and teachers and seeing his friends again. He might not have been nervous but his mother was. Even after all these years the thought of Secondary School and the crap that happened when I was there still makes me weak at the knees but I know my boy will cope. He has grown in confidence ever since he broke his hand. Yes it took a fight to make him realise that he doesn’t have to put up with bullying or other kids picking on him. Don’t get me wrong – James thinks that fighting is wrong and a waste of time – but he has realised he isn’t as helpless as he thought he was. 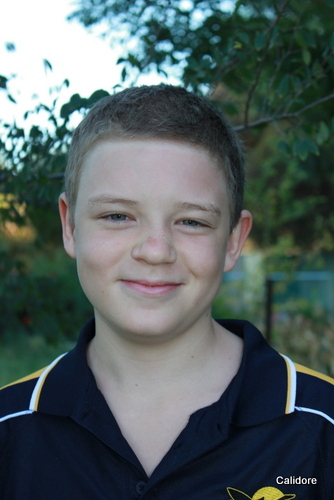 So after a small bit of bribery to be allowed to take photos – can you tell he’s really not into the whole school photo thing – we were off to school. James will walk home he tells me so I’m going to have to wait for all the news of the day. Now today of course, Nicola should also be starting school but she is in bed sick. I took her to the Doctor on Tuesday as she was having pains in her side that had been niggling her for a fortnight. I thought she had just pulled a muscle but the pain was getting worse so it seemed wise to see the Doctor. Much to Nicola disgust she had a blood test and she is booked in for an ultra sound this afternoon. The Doctor isn’t sure and it could be anything from a pulled muscle to appendix and we were told any changes to her go straight up to emergency. Which of course on Wednesday morning we did as she was running a temperature and really didn’t look well. Another blood test (which Nicola really, really wasn’t happy about) and a long wait we were told that nothing had shown up from the day before’s blood test (they accessed the files) and nothing showed up on this test. So today Nicola is resting and we will have the ultra sound and see if that shows up anything. Just to add a little more to the day’s mix I had an eye appointment this morning as I have found my sight to be deteriorating. Nothing serious but I do need my reading glasses for close work and now I have (when they arrive) glasses for long distance and driving as I have been struggling for a while. Update: Just got back from Nicola’s ultrasound. The clinic mucked up the appointment and told us it was at 5 pm and they had it down for 1.40 pm. Regardless it’s done and we will have the results and have a Doctors visit tomorrow at 4 pm so hopefully then we will know what’s happening. I’m working on the theory that tomorrow is a whole new month (where did this month go so quickly) and that life will be on the up instead of the ups and downs we have had this month. I am a Wife and Mum. Throw in my passion for spinning, knitting, crochet, dyeing my own wool, quilting, gardening and all things relating to my family and my life can become a trifle busy. I am owned by two dogs and a cat who all think they are boss despite my telling them they aren't. Home is the Mallee Region of Victoria Australia. No hills, no snow, hot summer tempretures and frosty winter mornings.